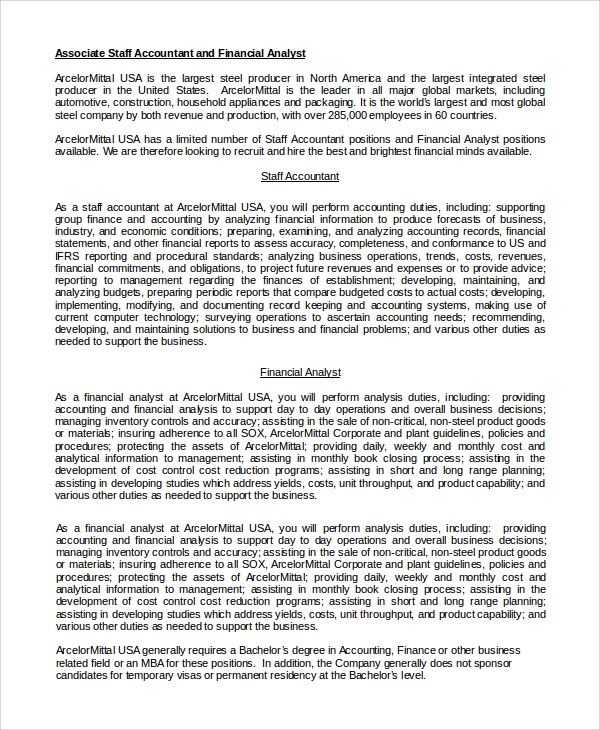 A financial analyst is responsible for analyzing the investment opportunities and proposals for companies. They have to forecast revenues and expenditures for future projects. They may work in collaboration with the executive level members of companies to come up with new policies and strategies that can be beneficial to the company in the long run. They also have to keep themselves aware of other company policies and current industry trends. You can view the Job Description Samples for a clear understanding of the job. 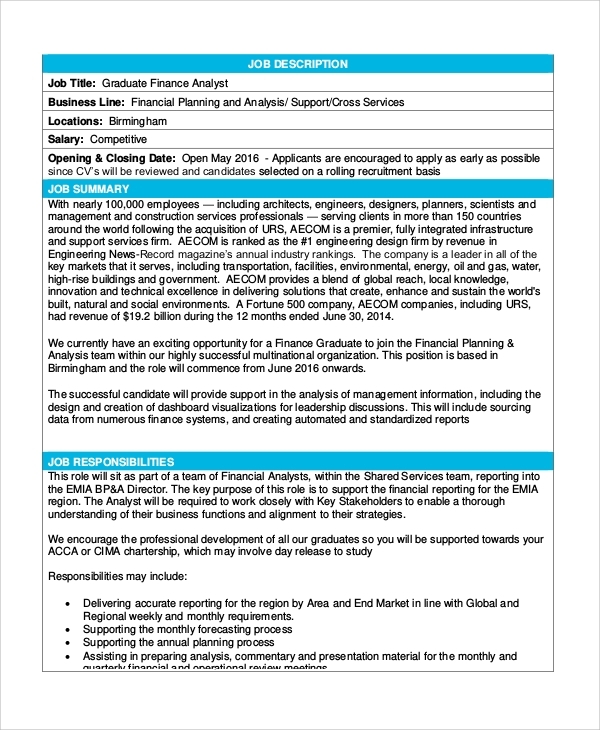 A graduate finance analyst has to make an analysis of the investment proposals and develop financial reports of the strategies to be adopted. He or she may work closely with the senior analysts to come up with new policies and programs. The role of a financial planning analyst pertains to decision making and planning of the policies, in general, to be taken. 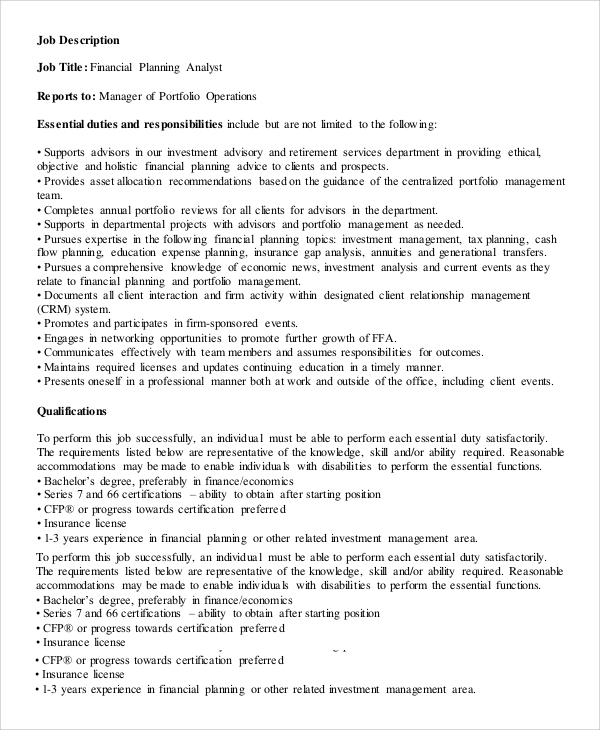 The job of a financial planning analyst also includes analysis of previous and current trends in the industry. 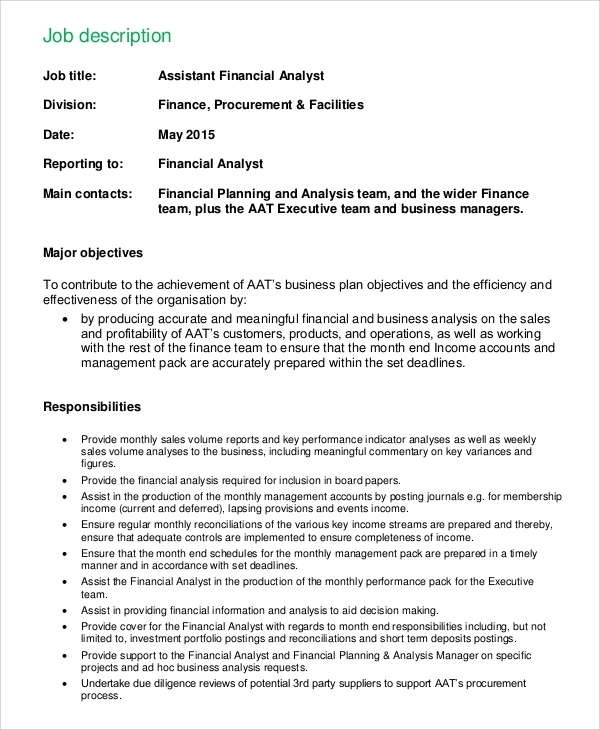 A senior financial analyst has to analyze the financial reports prepared by the graduate financial analysts. He or she may have to determine how the finance of a company can impact the business activities. The reports may include balance sheets, cash flow statements, income statements and so on. 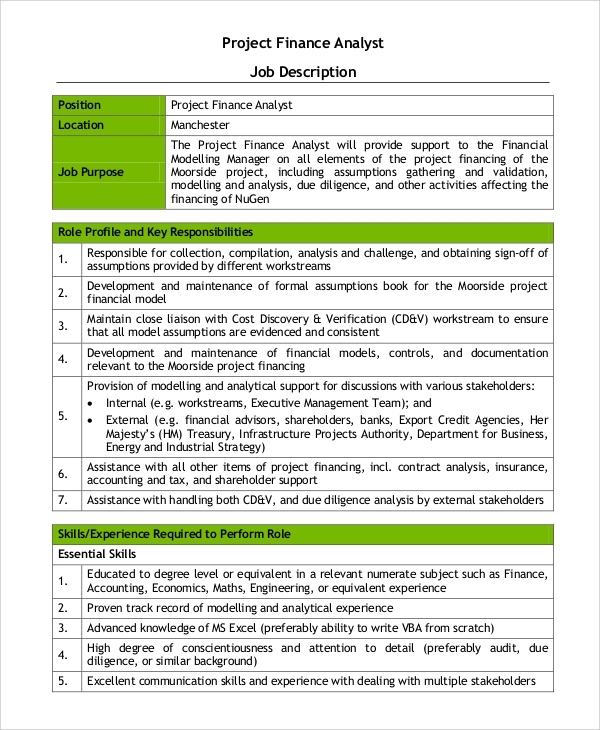 A project finance analyst’s job is to work in coordination with the project managers to ensure that timely reports on the budget are given out. The financial analyst also has to determine capital budgeting for the projects undertaken. 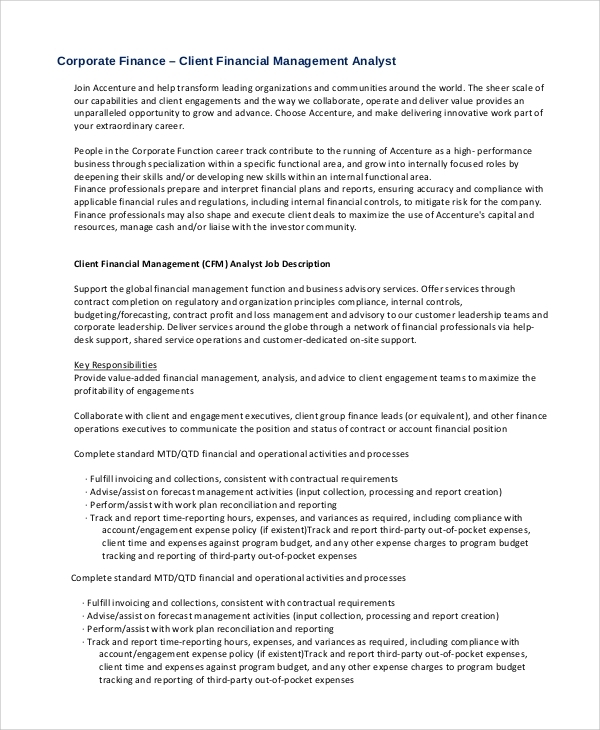 The corporate financial analyst has to provide a detailed analysis of the company’s financial performance and suggestions on how to overcome budget problems. 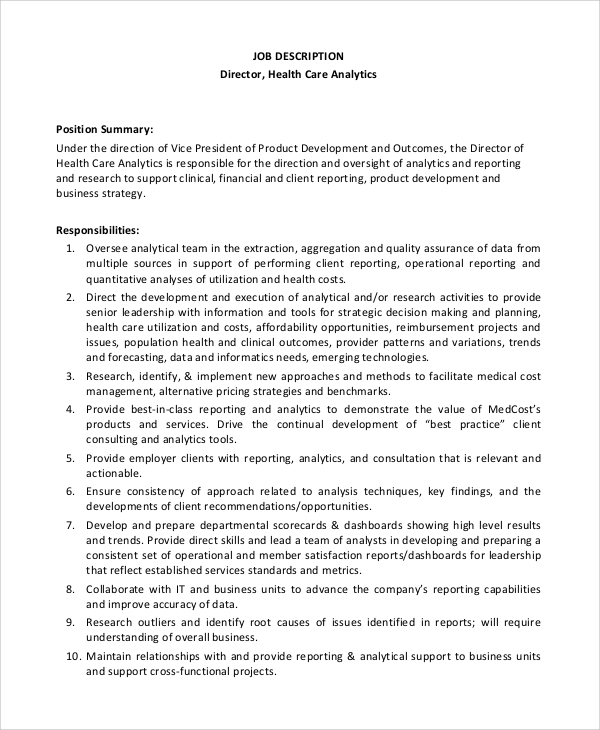 The analyst must have strong mathematical and analytical skills. The Financial Analysis Samples is a critical work for determining a company’s performance on an industrial scale. Financial analysts work with several other executive members of a company to develop strategies that improve capital budgeting. They also identify the industry trends and compare the results with the plans and policies. Financial analysts work in corporate companies that are running efficiently and on a large scale. They introduce new policies and programs for helping a company improve its performance. They also compare the industry trends with the existing strategies. They assist the company to become financially stable by recommending actions and providing useful financial information. Every company needs finance analysts to help them understand and know where it stands on an industrial platform. They have to keep track of cash management and taxes and formulate business policies based on the current market trends. 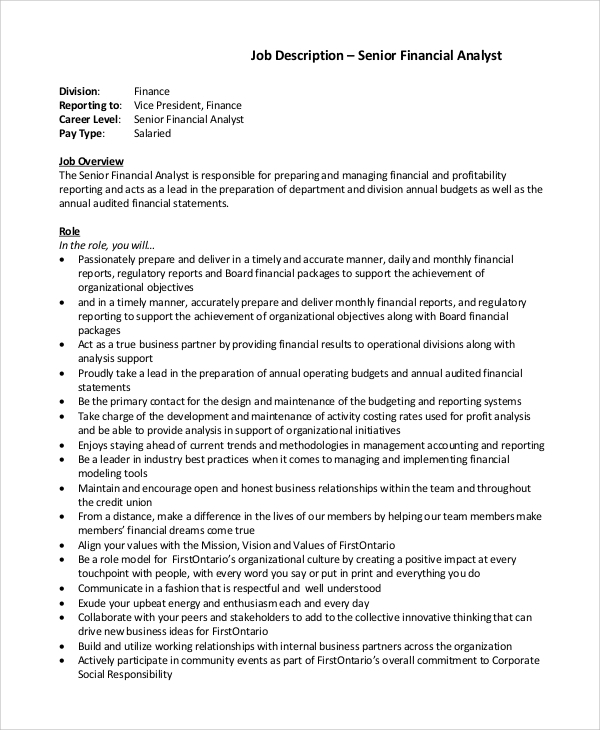 You could also see the Business Analyst Job Description Samples and how they contribute to a company’s progress.